QC 4.0 already promised a 0-to-50 percent battery charge in 15 minutes. We all want more power with less charging on our mobile phones. Qualcomm, the maker of the Snapdragon 835 processor, has long been working to provide lower power usage and faster battery charging. The current Quick Charge 4 technology, announced in November of last year, promises five hours of charge in five minutes, a 20 percent improvement in charging speed and 30 percent improvement in efficiency than the previous Quick Charge system. The company announced even more improved specs today: the Quick Charge 4+ system, which the company promises is up to three degrees cooler, up to 15 percent faster and 30 percent more efficient than Quick Charge 4. The first smartphone to use this new charging technology will be the Nubia Z17 from Chinese phone maker ZTE. 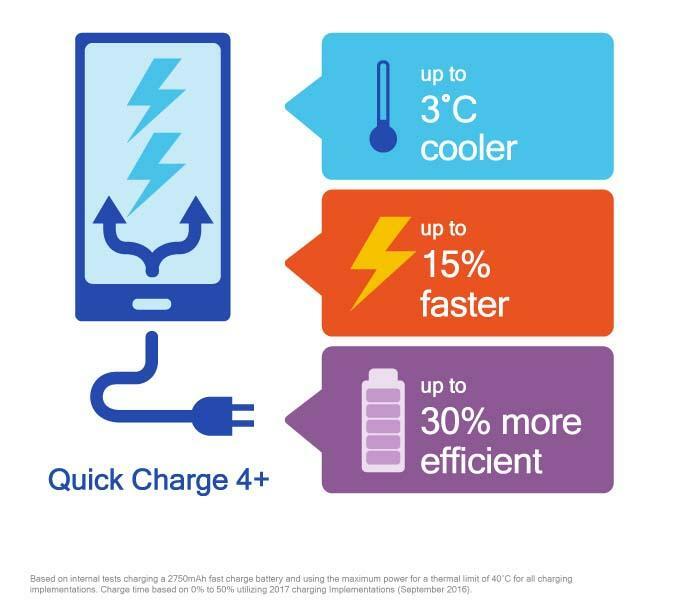 The new Quick Charge 4+ designation means that your smartphone or accessory has three enhancements: dual charging abilities, intelligent thermal balancing, and more advanced safety features. These all seem important in a world with exploding mobile devices. Dual charge devices include a second power management integrated chip which cuts the charge current in half, letting the chip dissipate heat faster and reducing charging time. Intelligent thermal balancing takes this even further, moving current to the coolest path automatically, which eliminates hot spots. Quick Charge 4+ devices must also monitor both case and connector temperature levels at the same time, which can help avoid overheating and damage to the Type-C connector. Only a few notable handsets include the Snapdragon 835 chip, including Samsung's Galaxy S8 and S8 Plus, Sony's Xperia XZ Premium, Xiaomi's Mi 6 and HTC's U11. Further, Qualcomm's list of Quick Charge-enabled models shows no devices with the 4th generation charging technology yet. This scarcity could mean that the new 4+ is more likely a replacement for the QC4 in upcoming smartphones, rather than a sequel.